C and I were in Davao during the recent holidays. One of our favorite stops was Aling Foping’s Halo Halo stand inside the Matina Town Square. One can choose from three sizes ranging in price from P85 for the regular and P155 for the Ultimate. Aside from these Durian Halo Halo and Mais Con Hielo are also available. What makes Aling Foping’s different is that you can actually create a bespoke Halo Halo if it pleases your fancy. Just pick up an order form and click the boxes of your favorite ingredients and voila, your own Halo Halo. We of course had the ultimate with extra Ube and Pinipig. It was quite refreshing and had a nice balance of different textures. Aside from the above ingredients, there was corn, Nata de Coco, Jackfruit strips, Beans, Mongo, Gulaman, Kaong (preserved Sugar Palm fruit) and, of course and dense Leche Flan. What I like the most was that the shaved ice that was used was very fine, and that the whole thing was not cloyingly sweet. Perfect for a humid afternoon snack or dessert if there is still enough tummy space. Be warned though, that the venue is set in an open area so there is no air conditioning. 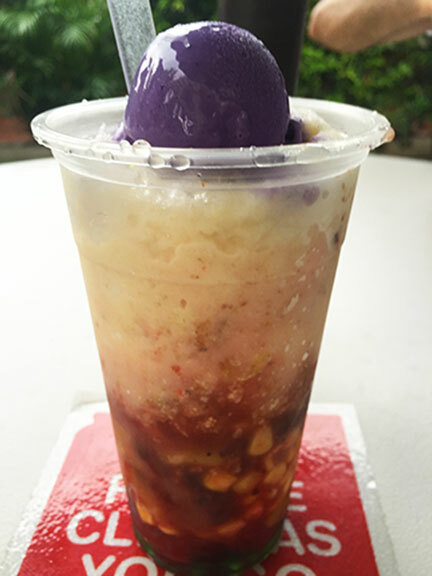 I have always been a fan of Halo Halo, and I can count Aling Foping’s as one of my favorites. Next time you are in the Davao area, be sure to give it a try. Haiyah! Japanese Finds: How About a Ramen Burger?